Whether your business is a single office with an entirely on-site staff, or hundreds of branches with thousands of remote workers, Software Defined Wide Area Networking brings simplicity, efficiency and performance to your communications and data infrastructure. Our highly resilient and optimized Cloud network, with nine points of entry across North America, affords scalability to support the growing needs of business WAN and Public Cloud connectivity. A simple, cost effective solution to provide secure data transfer between locations. 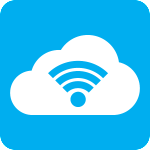 SD-WAN and SD-Internet solutions enable you to instantly connect branch offices and remote workers to your headquarters, and both public & private cloud data centers, using the built in automation tools. 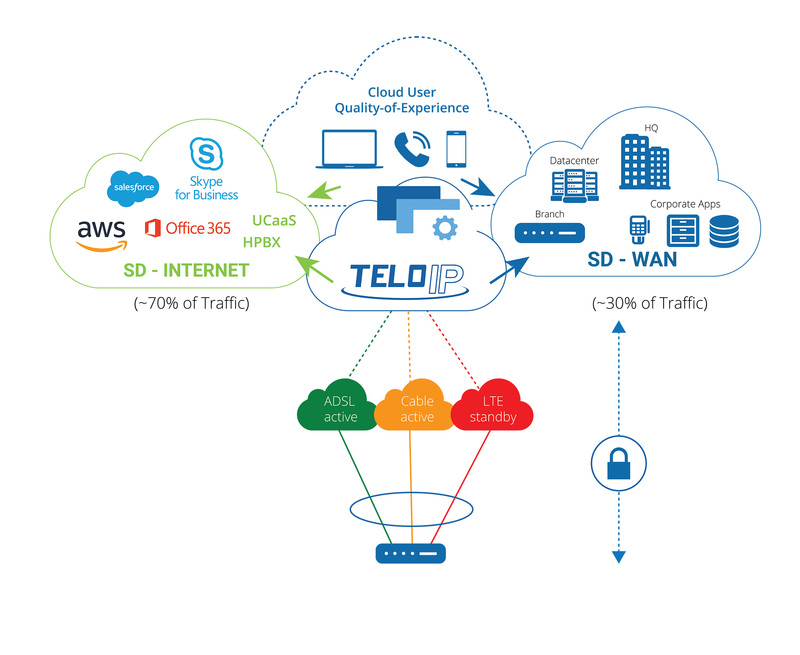 Orchestrated through Virtual Intelligent Network Overlay (VINO), backboned by TeloIP, all branch traffic is unified into a single cloud-managed SD-WAN OTT connection. Only TELoIP provides a comprehensive solution to replace MPLS for private cloud applications and ensures unbreakable tethers for public cloud applications, while optimizing both private network and public internet traffic. SD-WAN leverages public internet access from competitive carriers to reduce the cost of intra-site MPLS connectivity, and is generally much less expensive per megabit. This also provides the ability to leverage ubiquitous xDSL, Wireless and Cable connections to easily achieve high bandwidth objectives, even in less developed areas where fiber connectivity is unavailable or prohibitively expensive. By using any available service in any region or building, you are empowered with choice without being tied to one specific service provider for all your locations. There is no expensive hardware to purchase or maintain, saving both CAPEX and OPEX, while at the same time reducing your IT resources. Wide Area Networks can demonstrate unwanted characteristics due to geographic and environmental challenges, such as corrosion, flooding or other physical damage. These events may manifest themselves over the network through complete loss of connectivity, or more commonly, symptoms such as jitter, packet loss and congestion-related delayed or discarded data packets. Real-time applications, such as VoIP are the most sensitive to this, making the most business-critical applications the most vulnerable. SD-WAN provides a software approach by dynamically managing connections, and predictively circumventing conditions that impact networking quality. According to an IBM report, cybercrime is poised to become a 2.1 trillion dollar problem within this year. This statistic alone demonstrates why security is the number one reason for SD-WAN adoption. Using AES-256 encryption to secure your data bits, distributed through diversified pathways, both your internet and private data information is protected more securely than any single-line solution. Encrypted end-to-end between your branches and private clouds, our Tolly Certified solution is PCI 3.0 Compliant, with Stateful Firewall and encrypted remote access options for home users, mobile and teleworkers, including portable BYOD support for Windows, Android and MacOS devices. Another key benefit of SD-WAN and SD-Internet is the ability to monitor in real-time to quickly identify any deficiencies that might develop, including circumvention of problematic connections or routing instantly. With seamless automatic failover, even a complete ISP outage will not interrupt your business, while maintaining active VoIP calls during an event. By having an ‘always on’ IP address, you do not experience the post-outage delays often associated with re-synchronizations or DNS propagation that many redundancy alternatives suffer. By leveraging multiple pathways across our highly optimized North American backbone, your data is securely and dynamically transited across the most robust routes available at any given moment, predictively avoiding congestion and other factors that contribute to slow network performance. End to end prioritization via CoS/QoS/QoE ensures your most critical and latency sensitive applications are treated as such across the entire network. With services from 25 Mbps to 1 Gbps, built-in scalability allows your business to grow on demand. In contrast to dedicated MPLS connections, SD-WAN and SD-Internet services can be deployed in a matter of days. Delays associated with inter-carrier provisioning, construction and configuration planning, contracts addendums and carrier-based delivery times are a thing of the past. MACDs (moves/adds/changes/deletions) are also quickly manageable through your Orchestration and Management VINO portal, providing much more efficient change management in comparison to traditional services. 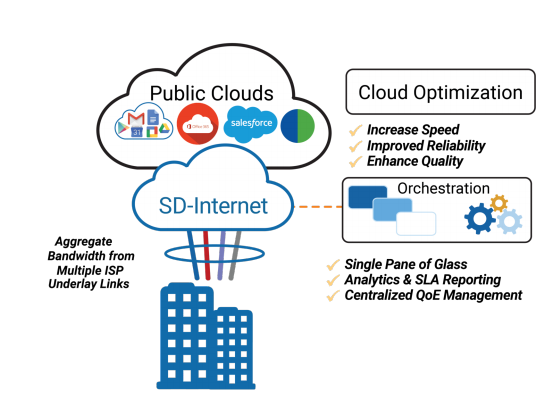 SD-Internet virtualizes network connectivity, providing faster and more reliable access to the Internet, with increased bandwidth and performance improvements for Cloud, VoIP and Video Conferencing applications. SD-Internet provides a high value solution for small and medium-sized businesses that rely on their connectivity. Combine cable, DSL, fiber and wireless connections together for a fully managed, always-on and always-fast solution. Please contact us to discuss how our customized bandwidth solutions are right for your business. Bandwidth aggregation – The sum total up/down bandwidth of all connections, all the time. High Availability with diverse media and backbone – copper, fiber and wireless, all at the same time. Bi-directional QoS (Quality of Service) providing priority transit over internet for real-time sensitive traffic, such as VoIP. Automatic, seamless fail-over redundancy with public IP retention – never drop a call or lose a session. WAN Optimization and Acceleration – get the best performance out of your connectivity. Performance Management and Monitoring – network professionals to spot the problem before it happens. Supports cable, xDSL, wireless, cellular, T-1 and fiber-based connections – up to 8 at a time. Combines all available network connections to deliver higher bandwidth with faster speeds. Lower cost per Mbps: SD-Internet provides an effective way to utilize the lowest-cost bandwidth solutions available, through multiple accesses. Fully Scalable: Give your workforce the speed they need today, and easily increase your bandwidth by simply adding another connection to ANA. Combines multiple carrier/ISP connections with diverse media to reduce the risk of downtime. Diversification of Access: ANA™ delivers high-availability Internet by leveraging media and carrier-diverse networks for the ultimate in reliability. Mix & Match Connections: You can combine connections of various types, through copper, coaxial, fiber or even over the air, ensuring unparalleled uptime through media-diversity. Bi-directional Quality of Service ensures clear and reliable VoIP, even under heavy network load. Per-Packet Intelligence: ANA™ maximizes the unique parameters of each connection, adjusting for optimal transport on a packet-by-packet basis. Queue-less Transport: Your VoIP, video-conferencing or other latency-sensitive traffic is prioritized, never buffered, virtually eliminating the risk of voice degradation or drop-out.